The earliest recorded is Nicholas de Lega who died in 1261, after him came the following list which may not be absolutely complete. The starting dates are of institution or presentation as they appear in the records. presented by the Lord Chancellor. In 1608 he was appointed Archdeacon of Norwich and rector of East Dereham and Winterton. presented by Francis Duncombe. He rebuilt the parsonage house and is buried at Moulsoe. presented by Francis Duncombe. 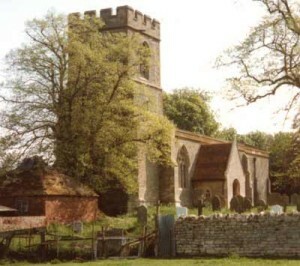 He was also Rector of Wavendon but was buried at Broughton. During this period, Broughton became part of the parish of Newport Pagnell and was served by the Rectors of Newport. Broughton was removed from the parish of Newport Pagnell and combined with Milton Keynes. This was a ploy to make the stipend of the Rector of Milton Keynes sufficient to run the huge Rectory in Milton Keynes Village. In the event, only one more Rector ever lived in it, and thereafter a new Rectory was built at Broughton to accommodate the Rector of the two parishes. Since 1984 the parishes have been combined with Wavendon and Walton to the south, and the whole forms the Ecumenical Partnership of Walton.